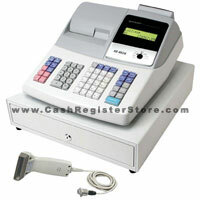 Sharp XE-A505 Electronic Cash Registers at Cash Register Store. REPLACED BY SHARP XE-A507. CLICK HERE. The Sharp XE-A505 is our lowest priced scanning cash register. Although low in price, there are many outstanding features found in the Sharp XE-A505 cash register. The XE-A505 replaces the XE-A402 with many additional features. The Sharp XE-A505 includes a scanner and a plu capacity of 7000 scannable barcodes. A new function added is an SD memory slot. Plug in a SD card and save a backup of your program. Free software is included with the XE-A505. This software has many useful features including cash register programming with secure back-up on the PC. Customize your own graphic logos by importing bitmap images and dropping them into the program. Upload sales reports at the end of the day to easily visualize sales trends. for Quickbooks users, a Quickbooks link is included to export sales data directly to Quickbooks. With free software there is NO tech support provided. We continue to offer free tech support on programming functions via the cash register. This policy includes the Quickbooks link feature. We DO NOT provide tech support exporting data to third party programs. Please note: Software does not work on Windows Vista or Windows 7.